This site is available in The Russian language as well as in English. 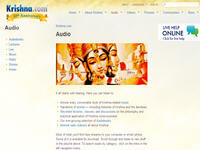 You can view devotional videos and can also buy CDs of Bhajans and Kirtans. Category Multimedia, Stores and Shopping July 7, 2012 by ISKCON Desire Tree.